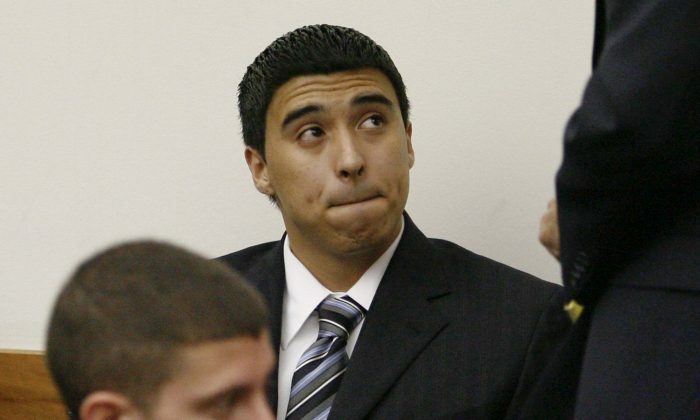 The son of former California Assembly Speaker Fabian Nuñez will be released from prison within a week after his sentence was significantly reduced by then-Gov. Arnold Schwarzenegger. Esteban Nuñez, now 27, was originally sentenced to 16 years in prison for manslaughter, over the death of a college student, 22-year-old Luis Santos, in San Diego State University campus. I used my relationship with the governor to help my own son. Nuñez, who entered prison in June 2010, was charged with manslaughter and assault for stabbing a knife to Santos’ heart. He claimed he was drunk at the time. On Schwarzenegger’s last day in office in 2011, he decided to shorten [Esteban] Nuñez sentence to seven years—with good behavior, it would be less than six. “It’s frustrating…two men can make up their rules so one of their murdering kids can get off the hook,” said the victim’s mother Kathy Santos, according to Fox 40. I take pleasure from the thought that he will screw up his life again. Schwarzenegger and [Fabian] Nuñez, a democrat who left office in 2008, were political allies when Schwarzenegger was governor. “I used my relationship with the governor to help my own son,” the father admitted to The Times. “I’d do it again.” He added that any father would have done the same if they were in his shoes. Schwarzenegger also admitted that he reduced the sentence because [Fabian] Nuñez is indeed a friend, but also, he thought the 16-year sentence was too harsh. We continue to grieve over the losses related to our son’s involvement in this tragic incident and pray daily for God’s healing grace. Our son has paid his debt to society and will continue to meet all legal and financial obligations to the victim’s family as agreed. He is committed to continuing the work of healing, self-reflection and spiritual growth. We respectfully request our privacy at this time. The California Department of Corrections and Rehabilitation said that Nuñez, who is being held at Mule Creek State Prison, will be on parole for three years. The department’s policy can not reveal the specific time and date of Nuñez’s release, according to the Los Angeles Times. I don’t think there will be a way out if he messes up again,” she said.